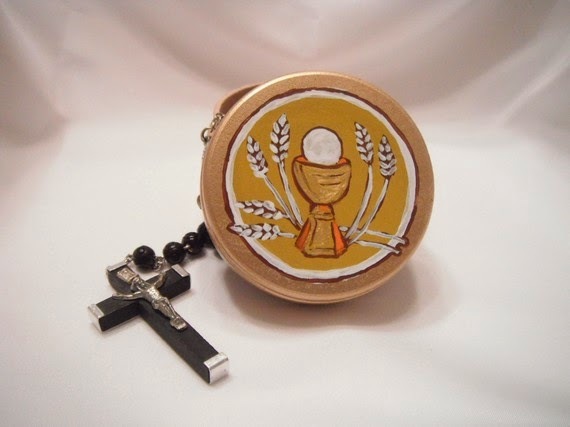 Life of a Catholic Librarian: Catholic tchotchkes for everyone! 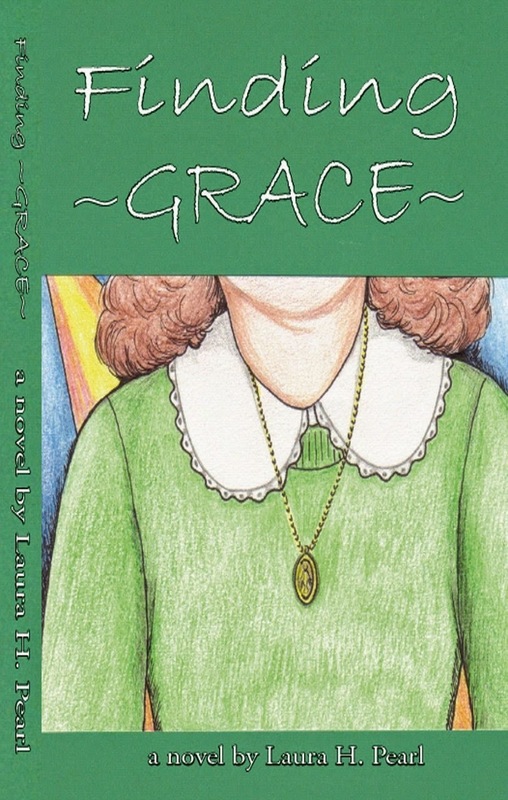 This is a lovely coming-of-age story for Catholic young adults, TONS of interesting moral fodder in here plus interwoven inspiration from the saints - excellent! Look for all the details next Wednesday. This Wednesday I have shopping on my mind, of the online variety, because is there any better way to shop when you're an introvert? I think not, dear reader. 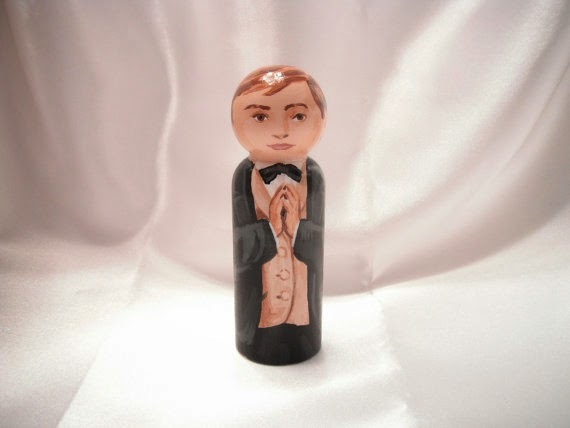 Since I am a person of the crafty persuasion (although if you ever saw me wielding glue in any form along with felt and uncooked macaroni or some other such three dimensional object you would doubt the veracity of that statement) I have quite a fascination with Etsy. 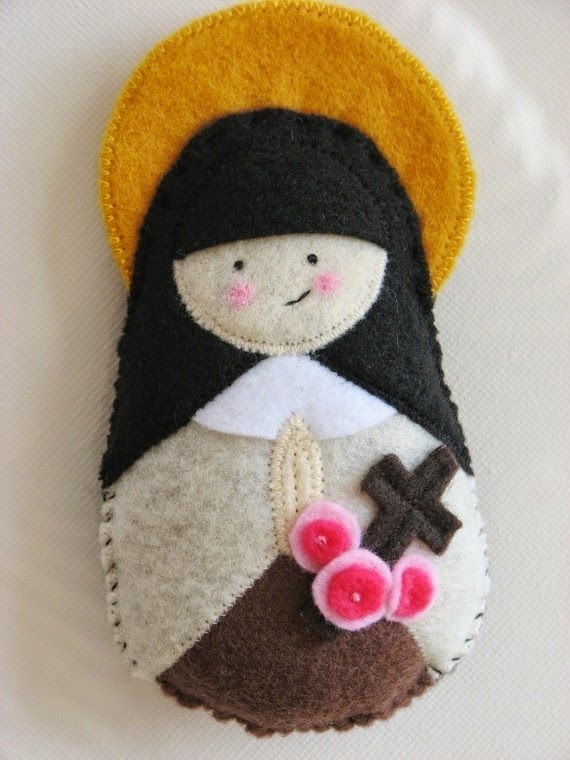 I absolutely love handmade items, whether they are made by me or someone else. Every year I like to carefully choose some handmade gifts for my kids in crafts that I stink at am not particularly gifted. ;-) I like to tuck these things into their Christmas stockings, and as you know, I am a bit nuts about starting Christmas shopping right around the vernal equinox. I've been doing lots of browsing and favoriting of new shops and items, and so thought it would be fun to share my ideas with all of you. I'm certain I'll do another one of these posts prior to the holidays, since this is certainly not an exhaustive list of Etsy shops that I find intriguing. But below are a handful that I've either purchased from recently or am plotting a purchase from soon. Perhaps it'll give you some ideas, and you can leave me your own ideas in the comments! And she has a custom listing for any saint you want. She will paint it. A-mazing. I found several that I want for my desk at work. 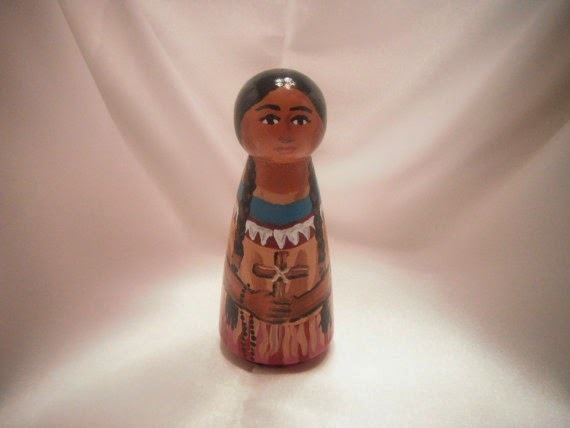 :0 Including that St. Kateri featured above, she's beautiful! Gorgeous! 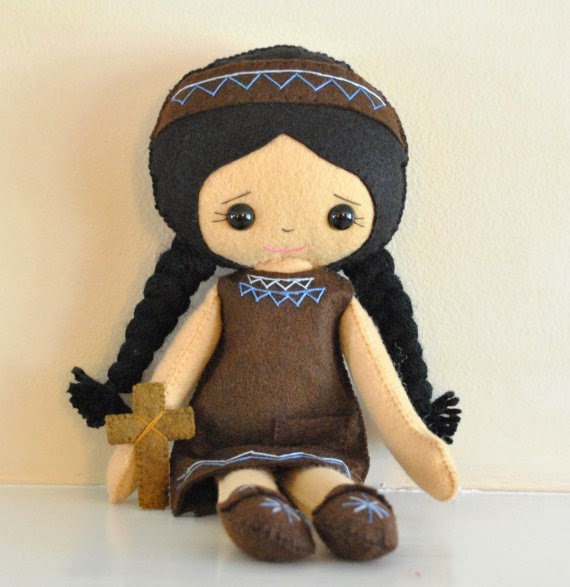 Anne could create all sorts of adventures for this St. Kateri, just as she would any of her other dolls. I am positively *itching* to order this. I mean, SO CUTE. She was having a Christmas in July sale when I ordered, so I picked out an angels and 3 Wise Men design for Anne that I know she'll love. 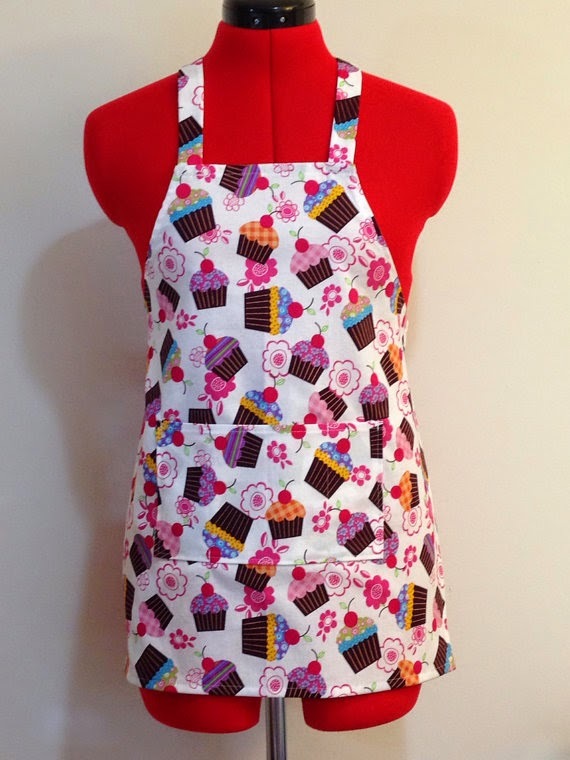 But so many cute patterns and extremely reasonable prices. She also sells makeup bags, which I'm thinking of getting for myself. 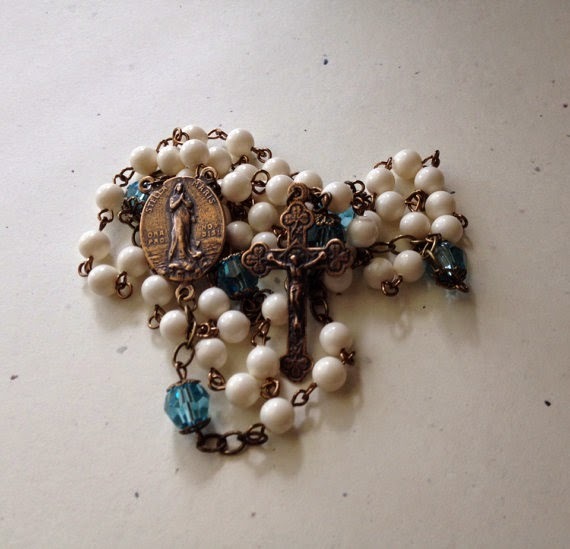 Thanks for the links--I visited Rosaries by Allison and loved that site! I'll have to keep it in mind for future gift-giving. I could get into a lot of trouble on Etsy for sure. The saint softies are so cute--and I totally would get the nativity if they expanded into softie animals--I mean, a softie donkey and sheep and camels? YES. So much to look at! I like the library-themed designs from The Bird and the Beard (I might need library due date card wedding invitations someday! ), and I just got a reusable coffee cup sleeve from Crafty Staci (gonna test drive it when I'm a Saturday Librarian this week). I might have to go back to Crafty Staci to get camera accessories for my shutterbug teen nephew. I got American Girl outfits for my niece's doll for Christmas (including a Hello Kitty Christmas dress!) from Designs by Althea. They were so cute. Also my environmentally conscious friend LibraryElfDesigns does these awesome denim grocery/tote bags from recycled blue jeans.